For Bria Bourgeois, CCAS BA ’15, it means winning three championships and traveling around the world. It means making lifelong friends. And it means receiving support when facing painful challenges. When injuries during her freshman, sophomore, and junior years limited Bria’s playing time, GW Women’s Basketball coach Jonathan Tsipis allowed Bria to keep her scholarship and serve as a student coach. 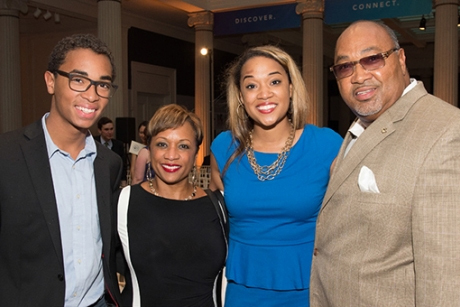 For parents Risa and Eddie Bourgeois, this sense of community—and Bria’s growth as a student-athlete—were reason enough to donate to the team and to GW Athletics in general through the Buff & Blue Fund. “We were so impressed with the support she received from everyone during her unfortunate injuries,” said Risa. "My husband and I always believed in athletic involvement among our youth and wanted to contribute to GW's other athletic programs." While Bria was recruited by major university basketball programs as a high school student, she chose to enroll at the George Washington University because of its excellent academic reputation. She describes her time on the women’s basketball team as "some of the best years of my young life." "My senior year alone, I went to Europe and the Bahamas, and I’ve won three championships with an amazing group of women," she said. "I've made lifelong friends with so many of my classmates, teammates, coaches and the administrative staff, all of whom have been so supportive on this journey." Bria’s positive experience as a student athlete matches that of Risa and Eddie as GW parents. Risa says parents should feel confident that their contributions will enhance GW Athletics and GW student life. “We've witnessed firsthand the development and growth of our daughter initially as a student-athlete and now as a well-rounded young lady and felt compelled to be a part of the development of future GW students," said Risa. "Philanthropy is important to us because it allows our involvement and support of GW, and assists GW in continuing to build a better student community and to provide internship and research opportunities and financial support for future Colonials in need." “We've witnessed firsthand the development and growth of our daughter initially as a student-athlete and now as a well-rounded young lady and felt compelled to be a part of the development of future GW students."